Reproduction or use, without express written permission from Tandy Corporation, of any portion of this manual is prohibited. While reasonable efforts have been taken in the preparation of this manual to assure its accuracy, Tandy Corporation assumes no liability resulting from any errors or omissions in this manual, or from the use of the information. 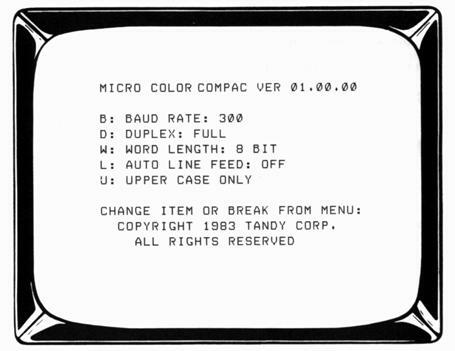 MC-10 Micro Color Compac: Copyright 1983 Tandy Corporation. Congratulations for selecting the TRS-80® Micro Color Compac for use with your MC-10 Computer (26-3011). This easy-to-use program enables you to communicate efficiently with information services such as CompuServe or Dow Jones. 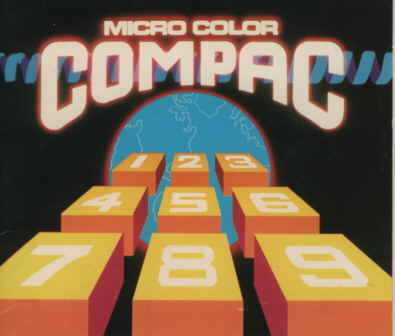 Micro Color Compac is a machine-language program on cassette tape which allows your MC-10 to communicate by telephone with an information service (i.e., host computer) such as CompuServe or Dow Jones. This means that, in addition to the MC-10 itself and the cassette tape, you'll also need a modem (such as the TRS-80 Modem I or Il) and a telephone close at hand. When you load and execute the program, you have the option of setting the communications protocol (baud rate, word length, etc.). Remember that you can set the protocol to whatever settings are required. The only limiting factor is that the settings you choose must match those of the computer system you're communicating with. For instance, if you set the baud rate to 1200 and the information service is sending information at 300 baud, communication cannot occur. To connect the MC-10 to a modem or acoustic coupler, you'll need a serial interface cable appropriate for operation with the modem or acoustic coupler you own. 1. Connect the modem to the MC-10 by inserting one end of the Color Computer Serial Interface Cable into the Serial I/O Connector on the Computer. 2. Connect the other end of the cable into the RS-232/CASS Connector on the Modem. See Figure 1. • If you're using a Modem I, set the NORMal/CASSette Switch to NORM. 3. Connect the modem to the telephone wall jack as described in your modem's operation manual. 4. Connect the modem to a power source as described in the modem's operation manual. If you need to use an extension cord or power strip, we recommend a Radio Shack Line Filter. Do not turn the power on yet! Be sure to set the volume control on the cassette recorder to a mid-range setting such as 5. 1. Turn all accessories ON. 2. Turn the television's power ON. 3. Turn the MC-10's power ON. 1. Insert the Micro Color Compac tape (supplied with this package) into the cassette recorder. The tape should be completely rewound. 3. Press PLAY on the recorder until it is locked in position. 4. The MC-10 will search for and load the program. While it is "searching" for the program, the letter S will appear in the upper-left corner of the TV Screen. 5. When the program has been found, the letter F and the filename will appear at the top of the Screen. 6. If you do not specify a filename, the first program encountered will be loaded into the Computer. 7. When the program has been loaded, OK will reappear on the Screen. 8. Press STOP on the recorder to stop the tape. 9. Unplug the cassette recorder from the back of the MC-10. Running the Program .. .
To run the program, type: EXEC [ENTER]. To select the communications parameter settings you need, press the key that matches the letter of the appropriate item. For example, press [B] to change the baud rate. The baud rate will then change from 300 to 1200. Press [B] again and 1200 will change to 110. Press [B] once more and 300 will reappear. Important Note! With Modem I or II, the baud rate must be set at 300. When [D] is pressed, the Duplex setting moves from FULL to HALF. Pressing [D] again changes the setting back to FULL. Each item on the menu rotates through the options available for that item. The following items further define the Micro Color Compac features. The selection of Full duplex allows simultaneous reception and transmission of data. If your TV display shows two characters for every character you type when communicating with another computer, you are using Half duplex. Set the protocol to Full duplex for normal characters. A 7 or 8 bit word length can be selected as needed. The Auto Line Feed determines whether the carriage return functions as a carriage return/line feed (the "Automatic Carriage Return") or carriage return only. This option allows you to select how the information will be displayed on your screen. Remember the settings must match those of the information service you're communicating with. 1. Dial the phone number of the information service you wish to communicate with. 2. When the host system answers, you'll hear a high-pitched sound. Set the modem's switch to ORG (for "originate"). 3. Press [ENTER] on the MC-10 keyboard. The information service will then be in control. You will be prompted to begin the log-on sequence so you can go "on-line" with the service. What happens next will depend upon the information service you're communicating with. See your information service user's guide for more specific details. Micro Color Compac features a communications menu which provides selectable baud rates (110, 300, and 1200), full or half duplex, 7 or 8 bit word lengths, optional auto line feed, and upper/lower case or upper case only mode. Control codes can be generated by pressing the Control Key with another key from A-Z. By keying in "BREAK"+"=" while in the Communications Mode, you enter the Buffer Examine Mode where you can examine any data scrolled off the screen. To exit this mode, use the system Reset at the back of the computer. Data in the buffer area is always the most recent data. Once the buffer is full, new data will be written over data previously stored in the buffer. The buffer area consists of two pages in a 4K MC-10 and 34 pages in a 20K MC-10. To scan the buffer area, key in "W" or "Z." Note: If a Form Feed is received, the Screen is cleared and the screen data is not scrolled off into the buffer area. Pressing the RESET button will force the program back to the menu area into default mode. This section will take you step-by-step through a sample log-on session. Modem I will be used to log-on to CompuServe. See your CompuServe Information Service User's Guide for details. Make sure the modem and cassette recorder are connected to the MC-10. 6. Press PLAY on the recorder until it is locked in position. 11. Dial CompuServe's phone number. PASSWORD: will then appear on the Computer display. Type in your password. For example: AGENT007 [ENTER]. Notice that the password was not displayed.